I wanted a spooky dead tree, but didn’t want to buy one. So I ventured out to a huge tree in our backyard, and cut a large branch off. It had tiny small flimsy branches and leaf’s all over it, that I just cut and pulled off. I spray painted it with black spray paint (Glossy) thoroughly and let it dry. 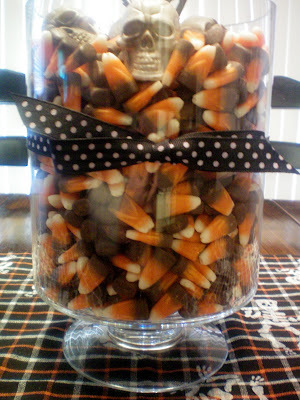 I had the jar already and I just filled it with candy corn and stuck the tree in. Here it is bare… and needing some more spookaliciousness! 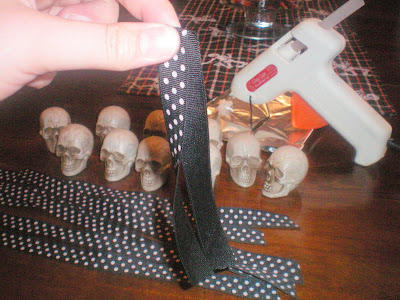 I found a bag of small skull heads and polka dot ribbon 50% off, at Michaels and WAM‘ that is when I new they were going on my Terrifying Dead tree. Cut ribbon to size and matched the ribbon up to the other pieces for even lengths. 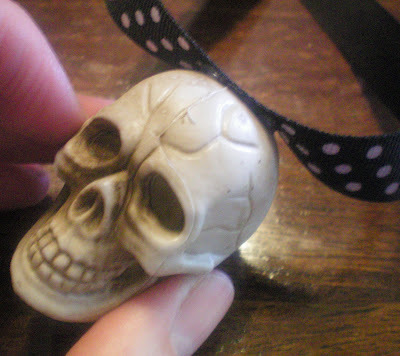 I folded the ribbon in half and held it that way, and then added a dab of hot glue to the top of the skull head. I then turned the ribbon over in the designated folded spot, and held it to the hot glue with one side of my hand held scissors for a few seconds. SO it will LOOK LIKE THIS! I chose spots I wanted to tie them off and hang them to. Some needed a little dab of hot glue to stay firmly in place. 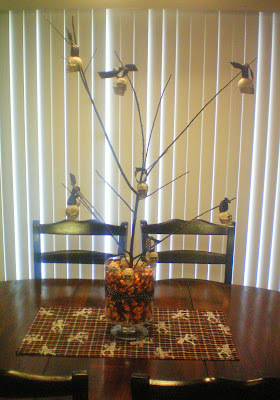 i DIDN’T need all of the skull heads, so some of them fell from the DEAD tree, like apples falling from theirs 😉 HE, HE! 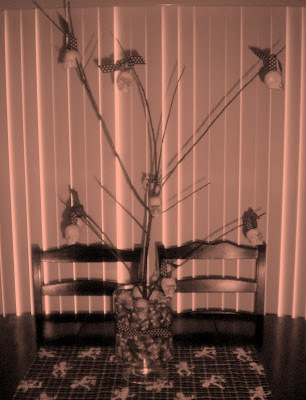 playing in picasa~ WARM spooky lighting! 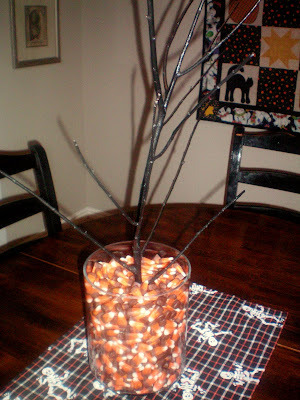 I am linking up with the Fall Festival at the Blessed Nest HERE and Whatever Goes Wednesday at Someday Crafts HERE. P.S. REMEMBER I am over at The CSI Project today! Judgeing all the great Back To School projects. 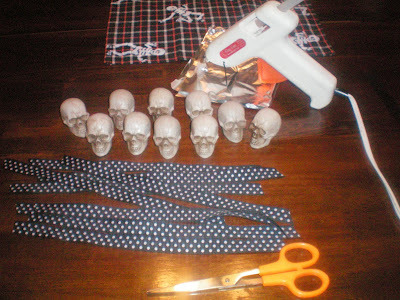 I am not a skull fan but I have to tell you, you make me want to use skulls!! This is great! Very Very Fun! 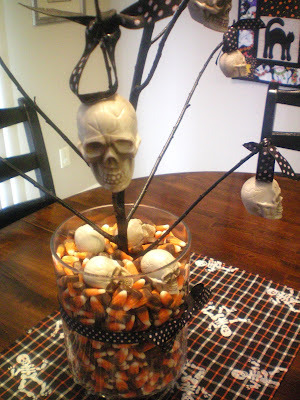 This is great, I am planning on making one as well this year! Thanks for the ideas. 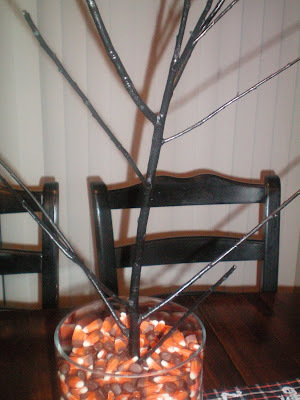 I really think we need stick trees for every holiday…don’t you? oh man, I LOVE your spooky tree! 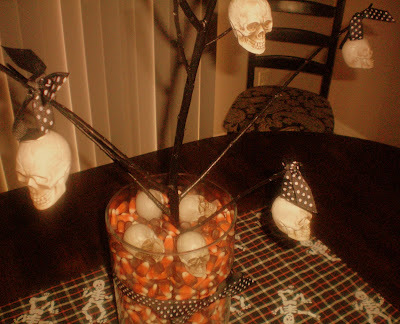 the heads hanging from it are AWESOME!! Cool! 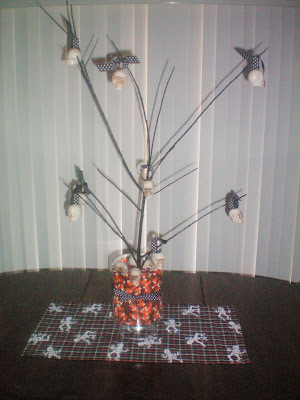 I’ve Christmas and Easter trees but not Halloween trees! Love it! how fun. so darn clever too. 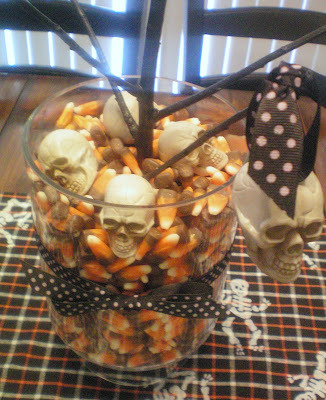 love love love the candy corn for a touch of whimsy to it as well. thanks again for linking up with the FALL FESTIVAL. love that you came back for week 2! Thanks for sharing! I am working on one today! I’ve been on a hunt for a great tree! I found one at my neighbors hosue. Long story, but a funny one!